The only bad news is that it's for sale in a city that I'm not sure we'll be moving to. Nor do I know when we'd be able to buy it (we're trying to sell Jon's home in Jacksonville, FL first). Sigh. But honestly, it is amazing. Does it have EVERYTHING that I would want in a home? No. But does it does have good bones that I could easily transform into my dreams. Yes. Right when I saw it, I fell in love. I've mentioned several times that Jon and I will be moving sometime this fall. We're still waiting to find out exactly where and when, but we're getting closer. So to torture myself pass some time yesterday, I decided to look at some houses in one of the cities we could possibly be moving. I know, I know. I was setting myself up to get my dreams crushed. In the words of my brother-in-law, I should "lay off the crack" :) But I just couldn't help myself. And of course, just when I thought I was safely browsing and not getting attached to anything, I found my dream home. 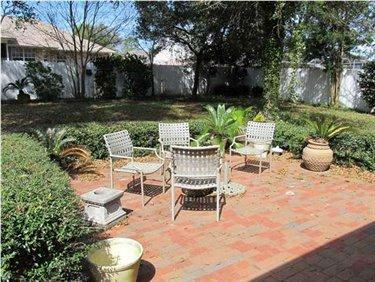 It's a 3 bedroom 2.5 bath (perfect size for us) with 2,500 square feet! Can we say spacious? And it's so charming. Just look at it. 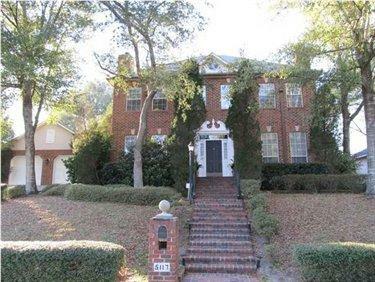 I love the sloped yard, brick exterior and landscaping. It says "home" to me. 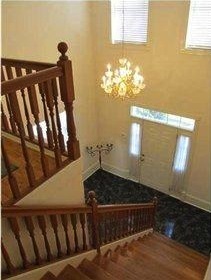 The next thing that got me was the tall and open entryway. 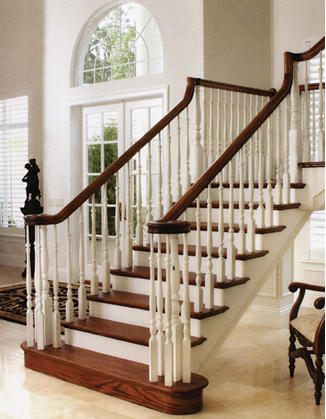 I'd want to switch out the light fixture and maybe stain/paint the wood railing to look like this (see image below), but I can see the potential. But I love how big and welcoming the entry is! I'm not sure about the green marble tiles...but again, nothing a little work can't change. 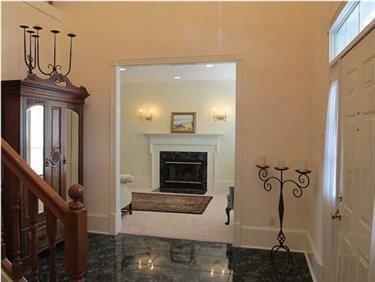 Off the entryway is a large living area (with sconces over the fireplace!) that leads into a large dining area that would easily fit all of our furniture. I'd want to update the sconces but at least there'd be no new wiring involved. And it already has recessed lighting and crown molding. 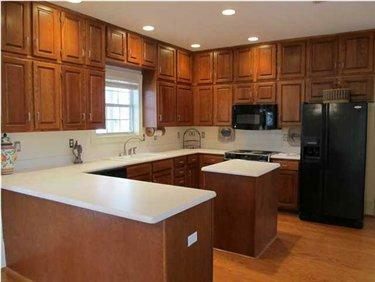 And look at all of the storage space in the kitchen! I would probably want stainless steel appliances eventually and while I'm a fan of white cabinets, I could definitely work with these. The surface countertops are a plus too. 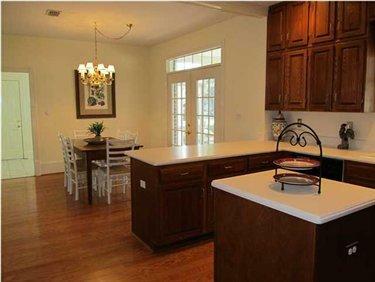 Right off of the kitchen is an eating area with french doors leading to outside. 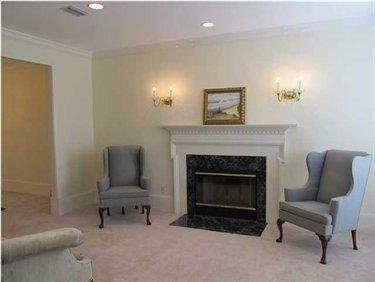 And attached to that is a family room with another fireplace! 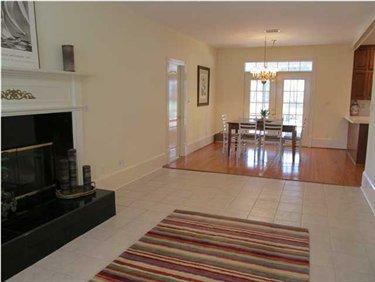 The fireplace could use a little update, but that's nothing I can't change. 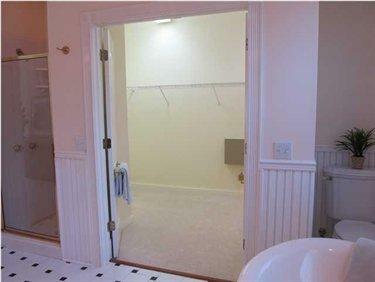 Up next is the master bath WITH A CLAWFOOT TUB (my dream!) and separate shower of course. 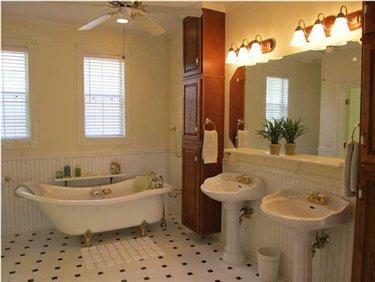 This tile and beadboard are in all of the baths (LOVE!). 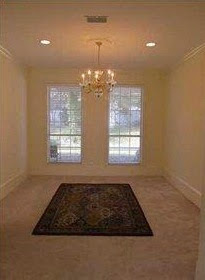 Right off of the master bath is this large double door walk-in closet! 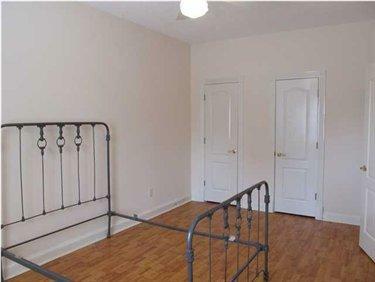 Two of the three bedrooms have hardwood flooring (the master has carpet). And check out the pretty panel doors. 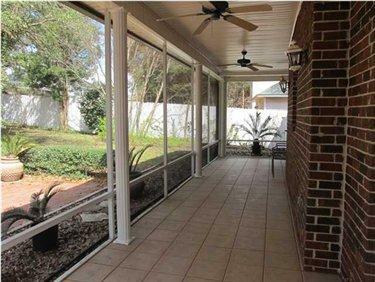 Now let's take a look outside at the long, screened-in porch. I could spend many an afternoon out here.